Come be a part of Skagit history! Seattle City Light has been offering the popular Diablo Lake Tour for more than 80 years. Cruise past amazing scenery while you learn about the area’s natural and cultural history and the Skagit River Hydroelectric Project which provides clean, low-cost, renewable power to Seattle. Start your adventure by boarding the Alice Ross IV – a new boat designed especially for the tours. The cabin features a roof that is nearly all glass to allow for the best possible visibility. The boat also has a heating and air conditioning system, as well as an on-board head. A 14-foot open aft deck also allows passengers to enjoy the tour from outside. 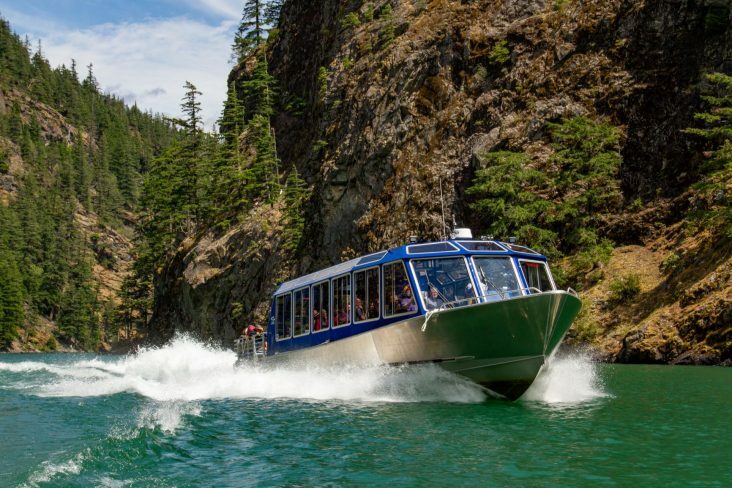 As you cruise glacier-fed Diablo Lake you will learn about the surrounding wildlife habitat and enjoy views of snow-clad mountain peaks, islands, and waterfalls. Experience parts of the lake that are typically hidden from view when traveling by highway or hiking on trails. Your tour will come alive with stories about the early explorers and settlers in the area and the challenges of dams and powerhouses in a very remote location. After our cruise is over we will go back to the North Cascades Learning Center for a locally sourced lunch (included). Have you ever wanted to get inside a powerhouse and see hydro-power at work? Our Powerhouse Tour will allow you to do just that! We’ll talk you through the historic town of Newhalem, the original. Enjoy the town’s beautiful landscape while hearing about the challenges of living and working in a community that was accessible only by train until the 1940s. We will end with a tour of Gorge Powerhouse, the oldest of the power plants of the Skagit River. Dorina is a lifelong Skagit County Resident. Retiring after 30 years in city government as a police dispatcher and Court Administrator, she spent the last several years as a family care-giver and working part-time for Seattle City Light, as a tour guide for the Skagit Hydroelectric Project, a Curves Trainer and Manager and the last two years for Bellair Airporter Shuttle where she works as a Customer Service Agent in Burlington. She enjoys traveling, scrap booking and gardening. When asked what she enjoys about being a tour host, her immediate response is “the wonderful people I get to meet from around the Pacific Northwest and from all over the world”. Touring with a professional driver and a tour guide/host is a great way to learn about the local area and find fun things to do and see. As a tour host her focus is ensuring that all tours guests have a fabulous experience and learn something new while touring. Dorina's been lucky enough to travel all over the US and Canada as well as Great Britain and her dream trip to Australia and loves exploring new places while traveling. Her motto is, “you don't get lost, you’re just exploring, someplace new.” She loves being a Tour Guide so she can share her love of Washington and Canada with those who are new to the area or those who may not be aware of the hidden gems in the Great Pacific Northwest.